I’ve started doing short education bit before the sermon called Morsels and Stories which is also recorded. This week’s was on the Baptismal Covenant. This morning Samuel lists all of the things a king would take. What does it mean when God asks us to give a similar list? The lessons can be found by clicking here. I worked most closely with 1 Sam 8:4–11, (12–15), 16–20, (11:14–15). Part of what I inherited when I came to the Church I serve was a labyrinth with a Peace Pole in the middle. Due to a variety of reasons, we now worship in a space not near them. So I found out via email that our pole had recently been vandalized. 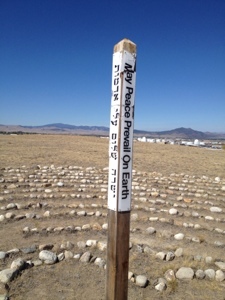 The four sides of our pole have “May Peace Prevail on Earth” written in English, Hebrew, Arabic, and Cherokee. The Hebrew, English, and Arabic sides had been damaged and the pole pulled out of the ground. Our Vestry had decided that if the damage was great, we would temporarily move the Pole to a storage location. Transportation is my job. As my day fell out, I wound up making this visit shortly after receiving a call from a vestry member very concerned about restoring the Peace Pole in the aftermath of the riots in Egypt and the murders in Libya. Standing there, looking at the destruction of a symbol of peace, aware of death and destruction half a world away, remembering the passion of my vestry member, I thought of former Bishop of New York’s comment about the Cathedral remaining unfinished until the work of Christ is finished. All of the sides were still readable, so for today, for this week, I left the pole in place. We are not going to leave it there forever, with its message of peace damaged. Our discussion will be ongoing as we discern our best decision. Our work is left undone. Our work is left undone. May we not be doing the work of peace, justice, and listening.